Location of Mequon in Ozaukee County, Wisconsin. 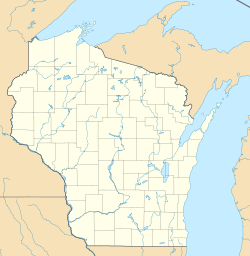 Mequon (/ˈmɛkwɒn/) is a city in Ozaukee County, Wisconsin, United States. The population was 23,132 at the 2010 census. The area was originally inhabited by Native Americans; by the early 19th century, the Potawatomi occupied land west of the Milwaukee River, while the Menominee lived between the Milwaukee River and Lake Michigan. European trappers, explorers and traders used the Milwaukee River through the middle of what is now Mequon as a means of transportation. The name "Mequon" is thought to have come from a Native-American word "Emikwaan" or "Miguan," meaning ladle, referring to the shape of the river in the area. The spelling was probably influenced by the French in the area at the time. Alternatively, the name may come from an Algonquin word meaning "feather", as suggested by the current Menominee name of the town which is Mēkon. In 1833, poverty forced the Potawotami to sell this land along with all their other land holdings in southeastern Wisconsin. They had hoped that allying themselves with the United States in the Black Hawk War would help them maintain their land, but these hopes proved futile. Following the treaty, the Potawotami were illegally forced out of the territory before the eight year grace period guaranteed in the treaty had ended. The expulsion of the Potawotami opened up the land for white settlement, and so between 1834 and 1836, a surveyor named Brink, along with his assistant Mr. Follett, surveyed the land to create the Town of Mequon. The Menominee sold their land in the area in the Treaty of the Cedars in 1836. Around this time, settlers came from New York and England, soon followed by German and Irish immigrants. In 1839, a group of immigrants from Saxony settled near the Milwaukee River. In the same year, twenty families from Pomerania founded Freistadt (German: Free city) in the western part of the Town of Mequon. The first Lutheran church in Wisconsin was built by these families in 1840. John Weston served as the first postmaster of the Town of Mequon, having settled in present-day Thiensville in 1837. He later sold his holdings to John Henry Thien. Thien, a wealthy immigrant from Saxony, had traveled north from Milwaukee and settled along the Milwaukee River, where his family built a dam and grist mill. Thien hosted the first town meeting for the Town of Mequon in 1846. The area around his estate, one square mile in the middle of the Town of Mequon, was later incorporated as the village of Thiensville in 1910. The Town of Mequon was incorporated as a city in 1957. Mequon is located at 43°13′27″N 87°57′36″W﻿ / ﻿43.22417°N 87.96000°W﻿ / 43.22417; -87.96000 (43.224243, −87.960094), about 15 miles (24 km) north of Milwaukee, lying along the western shore of Lake Michigan. It is part of the Milwaukee metropolitan area. Though much of the population lives in residential areas, approximately half of the land within the city's boundaries is undeveloped or farmed. According to the United States Census Bureau, the city has a total area of 48.77 square miles (126.31 km2), of which, 46.28 square miles (119.86 km2) is land and 2.49 square miles (6.45 km2) is water. As of 2005, Mequon was the third-largest city in terms of land area in the state of Wisconsin. Freistadt is a neighborhood of the city of Mequon. The community's name means "free city" in German. Originally in the Town of Mequon, the area was added to the City of Mequon through annexation. In early October 1839, approximately 20 families settled here to found the colony of Freistadt. Prompted by religious persecution in their homeland of Pomerania, Germany, the group sought and found a religious haven in Wisconsin. The community was home to the first Lutheran church in Wisconsin. In 1845, the synod, later known as the Lutheran Synod of Buffalo, was organized here. (Through mergers the Buffalo Synod became a part of the American Lutheran Church and the Evangelical Lutheran Church in America). The church in Freistadt became a part of the Lutheran Church–Missouri Synod in 1848. The first log cabin was located southwest of the present church building. The congregation immediately purchased 40 acres of land and in the spring of 1840 built the first Lutheran church in the state of Wisconsin. The log building, 30 by 20 feet, was also used as a school. The first pastor of the congregation was L.F.E. Krause (1841-1847). The Lutheran Buffalo Synod was organized at Trinity in June 1845. Since 1848, the congregation has been a member of the Lutheran Church - Missouri Synod. Mequon experiences four distinct seasons, with variation in precipitation and temperature being very wide. The overall climate of the city is moderated by nearby Lake Michigan, which causes temperatures to be cooler in summer and especially spring, and which keeps overnight temperatures warmer in winter. In March and April, the temperature in Mequon can be 10 to 15 degrees Fahrenheit (5 to 8 degrees Celsius) cooler than temperatures in towns just 15 miles (25 kilometers) further from the lake. In December and January, the effect is reversed, with temperatures in inland towns falling much lower. In Mequon, the warmest month of the year is July, when the high temperature averages 81 °F (27 °C), with low temperatures of approximately 59 °F (15 °C). June and July are the wettest months of the year, with the majority of rain falling in short-lived thunderstorms. January is the coldest month in Mequon, with average high temperatures averaging only 27 °F (-3 °C), and lows averaging 11 °F (-12 °C). February is the driest month, with almost all precipitation falling in the form of snow. In an average winter, 47.0 in (1.3m) of snow falls. The city's proximity to Lake Michigan often increases the snow received by the city. Most of the city's snowfall comes from systems such as Alberta clippers and Panhandle hooks. The highest temperature ever recorded in Mequon was 105 °F (41 °C) on July 24, 1935, and again on July 17, 1995. The coldest temperature ever recorded in the city was -40 °F (-40 °C), on January 17, 1982, also known as Cold Sunday. As of the census of 2010, there were 23,132 people, 8,598 households, and 6,561 families residing in the city. The population density was 499.8 inhabitants per square mile (193.0/km2). There were 9,145 housing units at an average density of 197.6 per square mile (76.3/km2). The racial makeup of the city was 92.0% White, 2.8% African American, 0.1% Native American, 3.6% Asian, 0.3% from other races, and 1.2% from two or more races. Hispanic or Latino of any race were 2.0% of the population. There were 8,598 households of which 32.4% had children under the age of 18 living with them, 68.9% were married couples living together, 5.1% had a female householder with no husband present, 2.4% had a male householder with no wife present, and 23.7% were non-families. 20.3% of all households were made up of individuals and 11.3% had someone living alone who was 65 years of age or older. The average household size was 2.56 and the average family size was 2.97. The median age in the city was 45.9 years. 23.1% of residents were under the age of 18; 9.2% were between the ages of 18 and 24; 16.2% were from 25 to 44; 34.1% were from 45 to 64; and 17.3% were 65 years of age or older. The gender makeup of the city was 48.6% male and 51.4% female. U.S. Census Bureau estimated the median income for a household in the city in 2009-2011 to be $106,647, and the median income for a family to be $124,422. The per capita income for the city estimated at $64,530. About 1.2% of families and 3.2% of the population were below the poverty line, including 1.2% of those under age 18 and 3.4% of those age 65 or over. During the same period, the median household value for Mequon was estimated at $357,200. As of the census of 2000, there were 21,823 people, 7,861 households, and 6,406 families residing in the city. The population density was 472.5 people per square mile (182.5/km²). There were 8,162 housing units at an average density of 176.7 per square mile (68.2/km²). The racial makeup of the city was 94.16% White, 2.25% African American, 0.10% Native American, 2.39% Asian, 0.03% Pacific Islander, 0.23% from other races, and 0.83% from two or more races. Hispanic or Latino of any race were 1.20% of the population. There were 7,861 households out of which 38.0% had children under the age of 18 living with them, 74.8% were married couples living together, 4.8% had a female householder with no husband present, and 18.5% were non-families. 16.1% of all households were made up of individuals and 7.4% had someone living alone who was 65 years of age or older. The average household size was 2.75 and the average family size was 3.09. In the city, the population was spread out with 28.1% under the age of 18, 4.2% from 18 to 24, 22.9% from 25 to 44, 31.2% from 45 to 64, and 13.6% who were 65 years of age or older. The median age was 42 years. For every 100 females, there were 97.4 males. For every 100 females age 18 and over, there were 93.8 males. The median income for a household in the city was $90,733, and the median income for a family was $101,793 (These figures had risen to $97,797 and $113,265, respectively, as of a 2007 estimate). Males had a median income of $72,762 versus $40,280 for females. The per capita income for the city was $48,333. About 1.3% of families and 1.7% of the population were below the poverty line, including 1.2% of those under age 18 and 2.7% of those age 65 or over. Since its incorporation in 1957, Mequon has had a mayor-council form of government. The mayor is elected for a three-year term. Dan Abendroth has been the mayor since 2013. Aldermen are elected to the Common Council from eight aldermanic districts. Concordia University of Wisconsin's School of Pharmacy, in Mequon. Most of Mequon is served by the Mequon-Thiensville School District, although 6 square miles (16 km2) in the far northwest is served by the Cedarburg School District. Three elementary schools, two middle schools, and one high school, Homestead High School, are part of the Mequon-Thiensville School District. In 2009, Homestead was ranked by BusinessWeek magazine as the state's top high school. The school's mascot is a Highlander. 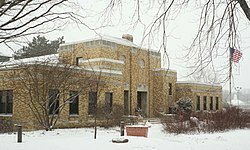 Mequon has a number of higher education institutions, including Concordia University Wisconsin, the Wisconsin Lutheran Seminary, and the northern campus of the Milwaukee Area Technical College. 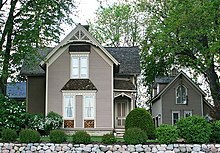 Mequon is home to ten National Register-listed historic places, including the Jonathan Clark House. Mequon contains more than two dozen parks and hundreds of acres[clarification needed] of community parks and nature preserves operated by the city, and some operated by the county. The Ozaukee Interurban Trail runs for 5.85 miles (9.41 km) south to north through the city. The Mequon-Thiensville Recreation Department conducts classes and programs for children and adults. The John Reichert Farmhouse, built in 1885. Garrison's Glen: 22 acres (8.9 ha). Neighborhood park on Pioneer Road near the Milwaukee River. Contains walking trail and canoe launch. Grasslyn Nature Preserve: 15 acres (6.1 ha). Nature preserve in the southeast of the city. Contains a walking trail and prairie area. Highland Woods: 85 acres (34 ha). Nature preserve on Green Bay Road north of Thiensville. Contains a walking trail and forest. Katherine Kearney Carpenter Park: 35 acres (14 ha). Dog walking park in southeastern Mequon. Contains walking trail. Lemke Park: 41 acres (17 ha). Neighborhood park in southwestern Mequon. Contains playground, picnic tables, archery range, soccer fields, volleyball court, baseball diamond. Lilly Lane Nature Preserve: 12 acres (4.9 ha). Nature preserve in southern Mequon. Contains walking trail. Mequon Community Park: 16 acres (6.5 ha). Community park just south of Thiensville. Contains swimming pool, baseball diamond, picnic area, playground, and access to the Ozaukee Interurban Trail. The Isham Day House, built in 1839, is now a museum and city park. Mequon Nature Preserve: 408 acres (165 ha). Nature preserve in southwestern Mequon. Contains walking trails, education centers, woodland, and observation tower. Prinz Site: 10 acres (4.0 ha). Nature preserve north of Thiensville. River Barn Park: 37 acres (15 ha). Community park in southern Mequon along the Milwaukee River. Contains baseball, soccer, and football fields and a playground. River Forest Nature Preserve: 62 acres (25 ha). Nature preserve in central Mequon along the Milwaukee River. Contains walking trail. Riverview Park: 20 acres (8.1 ha). Neighborhood park in central Mequon along the Milwaukee River. Contains bridge, canoe launch, playground, walking trail, and baseball diamond. Rotary Park: 75 acres (30 ha). Community park in northern Mequon. Contains basketball court, baseball diamonds, soccer fields, fishing ponds, and walking paths. Also contains Pukaite Woods which contains a handicapped accessible nature trail. The O'Brien-Peuschel Farmstead, is a National Historic registered site in northwest Mequon. Scout Park: 12 acres (4.9 ha). Nature preserve in eastern Mequon along the Milwaukee River. Contains a walking trail and river access. Settlers Park: 1.2 acres (0.49 ha). Historical park just south of Thiensville along the Milwaukee River. Contains a historic building and walking trail. Shoreland Nature Preserve: 19 acres (7.7 ha). Nature preserve in northeastern Mequon along the Milwaukee River. Contains walking trials. Swan Road Prairie: 20 acres (8.1 ha). Nature preserve in southwestern Mequon. Trinity Creek Wetland Habitat: 35 acres (14 ha). Wetland park in southern Mequon. Contains walking trails and educational facility. Villa Grove Park: 5 acres (2.0 ha). Community park east of Thiensville along Milwaukee River. Contains picnic tables and boat launch. Willow Bay Nature Preserve: 22 acres (8.9 ha). Nature preserve in northeastern Mequon along the Milwaukee River. Mee-Kwon Park: County park in northern Mequon. Contains public golf course, sledding hill and fishing pond. Virmond Park: 63 acres (25 ha). County park in eastern Mequon on Lake Michigan. Contains volleyball and tennis courts, baseball diamond, soccer field, picnic area. In 2005, CNN's Money magazine listed Mequon 19th among its 100 Best Small Cities in the United States, ranked jointly with Thiensville, a village surrounded by Mequon. Ronald D. Asmus, U.S. diplomat, grew up in Mequon and graduated from Homestead High School. John Ridley, Academy Award-winning screenwriter, director and actor, grew up in Mequon, and attended Homestead High School. ^ a b c Walter D. Corrigan, History of the Town of Mequon, Ozaukee County, Wisconsin, Brought Down to about 1870. Mequon: Mequon Club, 1950. ^ Hoffman, Mike. "Menominee Place Names in Wisconsin". The Menominee Clans Story. Retrieved 2018-10-05. ^ "Potawotami Treaties and Treaty Rights". Indian Country Wisconsin. Retrieved 2018-10-05. ^ Wisconsin Department of State, Mequon Certificate of Incorporation, May 24, 1957. ^ a b "Home - City of Mequon website". City of Mequon website. City of Mequon. Retrieved 29 November 2012. ^ Estimated Population per Square Mile of Land Area, Wisconsin Municipalities Archived 2011-10-05 at the Wayback Machine. The cities of Milwaukee (96.14 sq mi) and Madison (75.40 sq mi) are larger. Green Bay (45.53 sq mi) is the next largest city. The village of Kronenwetter is also larger, as are more than 200 towns. ^ a b c "Average Weather for Mequon, WI - Temperature and Precipitation". weather.com. The Weather Channel. Retrieved 29 November 2012. ^ a b c "Mequon city, Wisconsin". Selected Economic Characteristics - 2009-2011 American Community Survey 3-Year Estimates. U.S. Census Bureau. Retrieved 29 November 2012. ^ "Mequon city, Wisconsin". Selected Housing Characteristics - 2009-2011 American Community Survey 3-Year Estimates. U.S. Census Bureau. Retrieved 29 November 2012. ^ Milwaukee Journal, April 12, 1965. ^ Milwaukee Journal, April 7, 1971. ^ Milwaukee Journal, December 6, 1982. ^ Milwaukee Sentinel, April 6, 1977. ^ Milwaukee Journal, December 11, 1985. ^ Milwaukee Journal, September 3, 1986. ^ The Milwaukee Sentinel, April 9, 1992. ^ The Milwaukee Journal Sentinel, April 21, 2009. ^ The Milwaukee Journal Sentinel, April 2, 2019. ^ American's Best High Schools, Bloomberg Businesweek. ^ "Fast Facts". Homestead High School. Mequon-Thiensville School District. Archived from the original on 2016-05-05. Retrieved May 3, 2016. ^ "Best Place to Live - 2005". Money Magazine. CNN. Retrieved 30 November 2012. ^ Dudek, Duane (16 Jan 2014). "Mequon native Ridley talks Oscar nominations for '12 Years A Slave'". Milwaukee Journal-Sentinel. Archived from the original on 3 March 2014. Retrieved 3 March 2014. ^ Lee, Chris (3 March 2014). "Oscars 2014: '12 Years a Slave' wins for adapted screenplay". Los Angeles Times. Retrieved 3 March 2014.